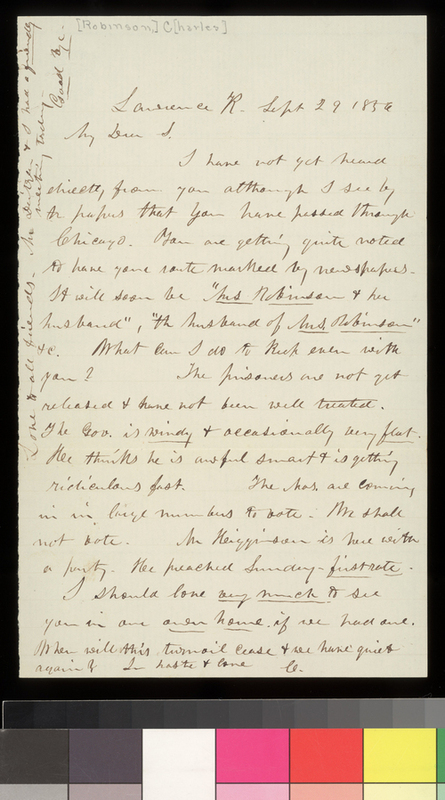 Writing from Lawrence, Kansas Territory, Charles Robinson writes to his wife, Sara Robinson, who was traveling East via Chicago, Illinois. After kidding her about how well-known she was becoming, he comments unfavorably on Governor John W. Geary, who "thinks he is awful smart & is getting rediculous fast." Robinson also mentions the forthcoming legislative election (October 6, 1856)--"We shall not vote."